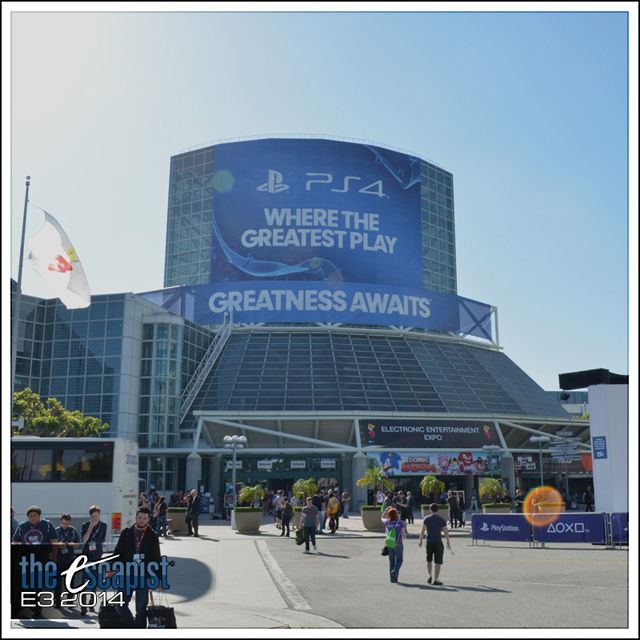 Our brains are too fried from E3 2014 to remember what happened. Luckily, someone brought a camera. After spending the week taking pictures at E3, I think I finally know what it's like to work as a wildlife photographer: the growling, the stampeding herds, and the smell--good god the smell. It's all very National Geographic. Every year, the convention has it's own personality and subtext. Last year, thanks to the impending kickoff of the Xbox One and PlayStation 4, there was a weird kind of tension between Sony and Microsoft. Sony continuously took subtle jabs at the competition, and Microsoft refused to acknowledge that Sony even existed. Microsoft fights like a passive-aggressive Midwestern housewife. Third-party publishers like Ubisoft, EA, and Activision were also doing an awkward little tap dance during last year's convention. They were desperately trying to show off the potential of their next-generation titles, while simultaneously downplaying the transition so that any in-development games for the 360 and PS3 wouldn't seem undesirable. It was all very confusing. This year, however, things were a little more relaxed. Very few shots were fired between Sony and Microsoft, and the third-party pubs are obviously gung-ho about the Xbox One and PlayStation 4. In fact, the only truly awkward part about this year's convention was the Electronic Arts booth. It screamed, "Please don't look at us. All of our games are coming out in 2015." Now that you understand the subtext, the gallery awaits.